There are some folks who like to watch football and some that are just in it for the food. 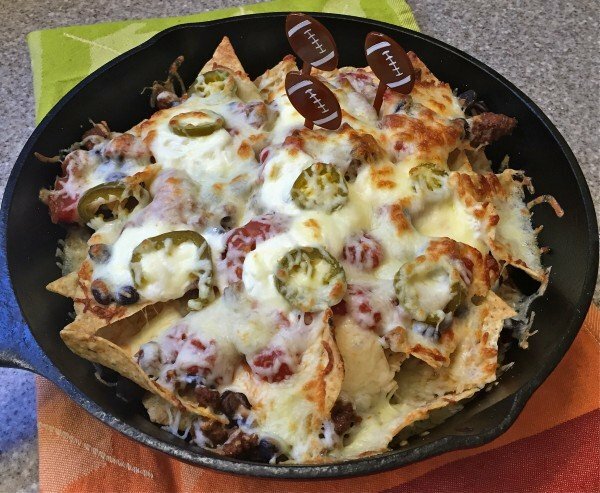 These, no silverware necessary, Skillet Macho Nachos are perfect for either and perfect for game-day snacking. 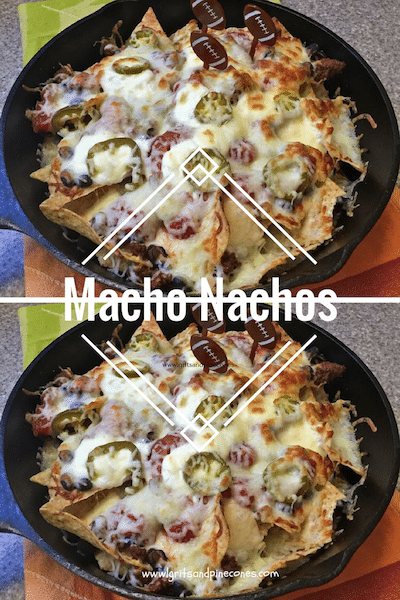 I guarantee you that these yummy nachos will be the hands down favorite at any party, but they are the ultimate party snack for a Super Bowl Party. They are also perfect for a casual lunch or even dinner. 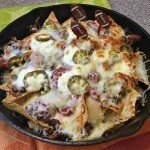 The nice thing about nachos is that you can add or change ingredients according to your taste. Swap the ground chuck for chicken, and you have chicken nachos. Leave the meat out altogether, and you still have nachos. I think the only rule for nachos is you have to have tortilla chips and cheese. The rest is up to you! You could even have a nacho bar, where you give each person a pan of tortilla chips and cheese and then let them add the toppings they like: Pico de Gallo, refried beans, chopped onion or scallions, black olives, sliced avocado, chopped tomatoes, cilantro. The possibilities are endless. I use Monterey Jack cheese in this recipe, but you can use whatever cheese your family likes. Or, mix it up and use 2 or 3 different types of cheeses. It’s up to you. You will also notice, I give a pretty big range of the cheese amount, 2-4 cups. I like a lot of cheese, but feel free to scale back on this to suit your taste. 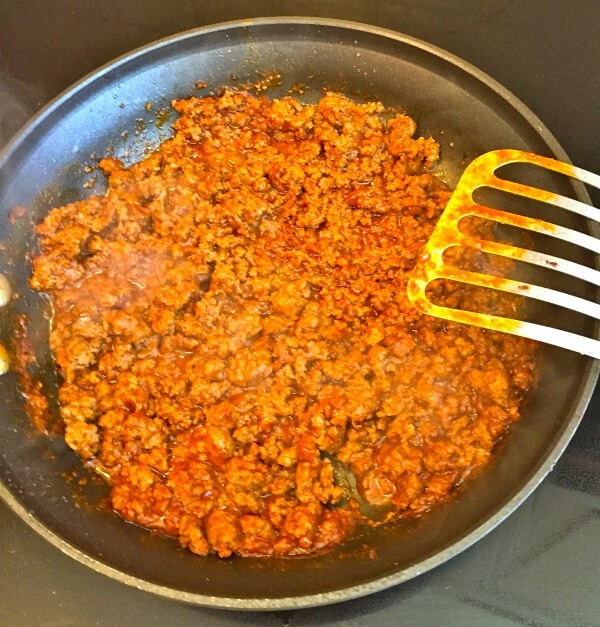 This recipe is one of our family’s favorites. Try it today, or experiment and make your favorite nachos! 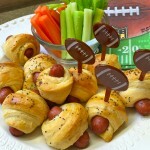 Looking for other game day appetizers, check out my Crispy Buffalo Wings, Buffalo Chicken Dip, and Pigs in a Blanket. Still need more? 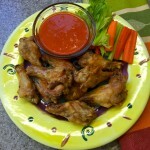 Check out the appetizer section of my Recipe Index. 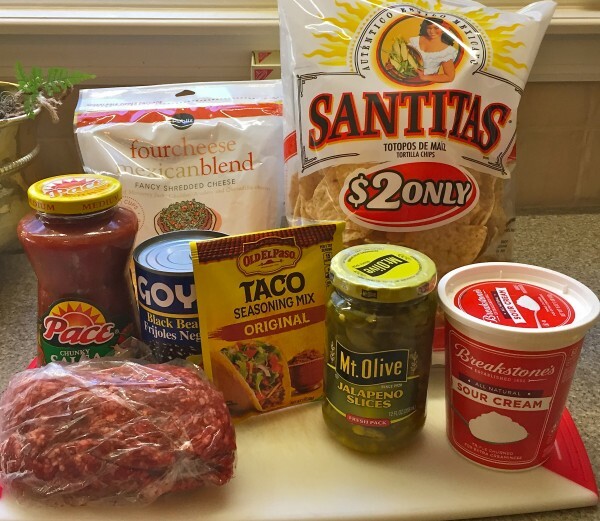 The ingredients for this recipe include ground chuck, dry taco seasoning mix, a can of black beans, tortilla chips, sour cream, salsa, jalapeno peppers, and Monterey Jack cheese. **Here is the secret to good nachos. Add your ingredients in layers to ensure that all chips are covered in something yummy! To assemble your nachos, put a layer of tortilla chips in the bottom of a baking sheet or large pan. I like to use a cast iron pan. Sprinkle half of the ground beef mixture and half of the black beans over the first layer of chips. Sprinkle 1-2 cups shredded cheese over the top. Add another layer of chips, meat mixture, and beans and top with the remainder of the cheese. Add a few dollops of sour cream, a few spoonfuls of salsa and top with jalapeno slices. Put under the broiler and cook until the cheese is melted and bubbling. Watch it carefully! This will only take 1-3 minutes. Serve immediately. **This recipe makes enough for 2-9 inch cast iron pans, or 1 large baking sheet. If you use a baking sheet, use one with sides. 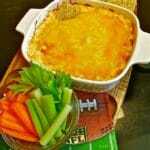 There are some folks who like to watch football and some that are just in it for the food. These, no silverware necessary, Skillet Macho Nachos are perfect for either. To assemble your nachos, put a layer of tortilla chips in the bottom of a baking sheet or large pan. Sprinkle half of the ground beef mixture and half of the black beans over first layer of chips. Sprinkle about 1-2 cups shredded cheese over the top. Add another layer of chips, meat mixture, and beans and top with the remainder of the cheese. Add a few dollops of sour cream, a few spoonfuls of salsa and top with jalapeno slices. Put under the broiler and cook until the cheese is melted and bubbling. Watch it carefully! This will only take 1-3 minutes. Here is the secret to good nachos. Add your ingredients in layers to ensure that all chips are covered in something yummy! Thank you for visiting my blog! I hope you will try some of the recipes. If you are not already a subscriber and would like to receive an email whenever I post a new recipe, enter your email address in the Subscribe block at the top right of this page.